At the passing, in February 2001, of Chalcedon’s founder and my father, R. J. Rushdoony, there was debate both within and without the foundation about the course that it should follow. When we think of Dr. Rushdoony’s impact on Christian education, we might think first of his courtroom testimony on behalf of Christian schools and homeschools. 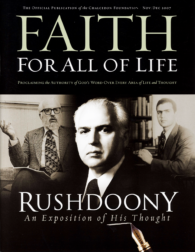 R. J. Rushdoony’s central impact on the Biblical family involved his unabashed declaration that as God’s basic institution, the Biblical family is the primary force in the fulfillment of the dominion mandate and the Great Commission.